The Dr. Martens® 1461 Eastern Art three-eyed shoe takes traditional Japenese art and puts a fresh, contemporary spin on it. The boot features hand-drawn paintings that have been digitally printed onto the leather to emulate traditional Japanese parchment for an incredibly unique and stylish look. Backhand Straw Grain leather upper is made of a full-grain, fully finished softy comfort leather with a fine print. Gold-tone studs highlight the leather for an eye-catching touch of style. Traditional lace-up system with fabric laces and gold-tone eyelets for a sturdy fit. Classic heel loop. Goodyear® welt construction where the upper and sole are heat-sealed and sewn together with the classic Z-welt stitching for long-lasting durability and flexibility. Comfortable leather lining. Lightly cushioned leather and textile insole for all-day comfort. Dr. Martens' original air-cushioned outsole is slip, oil, and abrasion resistant. It also features a classic grooved sole pattern. Imported. Measurements: Heel Height: 1 1⁄4 in Weight: 1 lb 3 oz Platform Height: 3⁄4 in Product measurements were taken using size UK 6 (US Women's 8), width M. Please note that measurements may vary by size. Weight of footwear is based on a single item, not a pair. 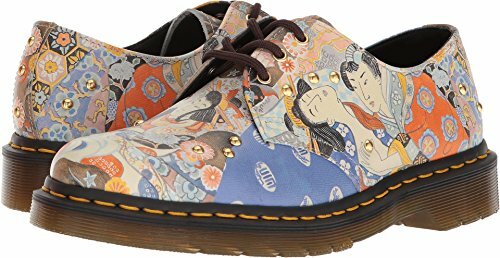 The Dr. Martens® 1461 Eastern Art three-eyed shoe takes traditional Japenese art and puts a fresh, contemporary spin on it. The boot features hand-drawn paintings that have been digitally printed onto the leather to emulate traditional Japanese parchment for an incredibly unique and stylish look. Backhand Straw Grain leather upper is made of a full-grain, fully finished softy comfort leather with a fine print. Gold-tone studs highlight the leather for an eye-catching touch of style. Traditional lace-up system with fabric laces and gold-tone eyelets for a sturdy fit.